If you purchased it, it is indeed active! Otherwise you wouldn't be able to have it! Just keep an eye out for future listings! Hi! So unfortunately with how it's set up right now, you can only get one birthday cupcake per day, even if you have two pets on the same birthday. So with Mystery Pic, a script judges answers and gives out prizes and then we set up the next contest and it overwrites all the old info. Which means, if the script for some reason fails to run and the next contest is set up, there's no running it again and then nothing we can do about it. Sorry guys! So we do in fact have a list with changes/fixes/improvements the BD needs, with the intention of eventually tackling said things. But it's not actively being worked on right now (resources and all). I know that's not the soon you were looking for, but at least you know it's something we have thought about and looked into! I'll send this over to those darn meepits to see what they did, and see if I can bribe them to get it working again. Sorry, but no we don't. Despite the ratio of older/younger users, we do allow and knowingly have younger users, which means all chat rules have to be made with them in mind (COPPA compliance and all that jazz). There are plenty of sites for older players to chat about whatever they want, but unfortunately this isn't one of them. PSA from CQ: Hi y'all! Congratulations to all those accepted into the 750th issue! As a little public service announcement for my inbox/customer support, for those of you who don't know, special anniversary prizes, avatars and collaborator trophies have to be manually awarded by me. In case you didn't notice, there's quite a number of you, so it takes some time. If you have not yet received it, DO NOT PANIC. It's coming on Monday, I promise! Until then, just look at the pretty Weewoo. When procrastination gets the best of you. 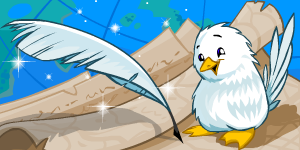 The White Weewoo traveled all over Neopia for the 750th issue of the Neopian Times! Doesn’t that sound exciting? He did it all by flight, too! Neopia is a vast world with so much to see and do. It’s an adventure waiting to happen! 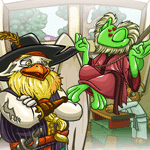 With that being said, I’m going to tell you about some of the White Weewoo’s top destinations on his tour through Neopia.